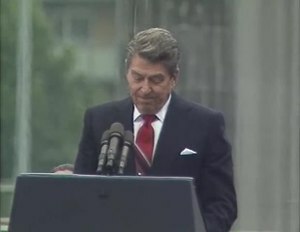 Complete speech by Ronald Reagan at the Brandenburg Gate, Friday, June 12, 1987. Famous passage begins at 11:10 into this video. "Tear down this wall!" is a line from a speech made by U.S. President Ronald Reagan in West Berlin on Friday, June 12, 1987, calling for the General Secretary of the Communist Party of the Soviet Union, Mikhail Gorbachev, to open up the barrier which had divided West and East Berlin since 1961. Peter Robinson, the White House speechwriter who drafted the address, said its most famous line was inspired by a conversation with Ingeborg Elz of West Berlin who had mentioned it in a conversation with him. The "tear down this wall" speech was not the first time Reagan had addressed the issue of the Berlin Wall: in a visit to West Berlin in June 1982, he'd stated "I'd like to ask the Soviet leaders one question [...] Why is the wall there? ", and in 1986, 25 years after the construction of the wall, in response to West German newspaper Bild-Zeitung asking when he thought the wall could be "torn down", Reagan said, "I call upon those responsible to dismantle it [today]". On the day before Reagan's 1987 visit, 50,000 people had demonstrated against the presence of the American president in Berlin. During the visit itself, wide swaths of Berlin were closed off to prevent further anti-Reagan protests. The district of Kreuzberg, in particular, was targeted in this respect, with movement throughout this portion of the city in effect restrained completely (for instance the subway line 1 was shut down). The speech was also a source of considerable controversy within the Reagan administration itself, with several senior staffers and aides advising against the phrase, saying anything that might cause further East-West tensions or potential embarrassment to Gorbachev, with whom President Reagan had built a good relationship, should be omitted. American officials in West Germany and presidential speechwriters, including Peter Robinson, thought otherwise. 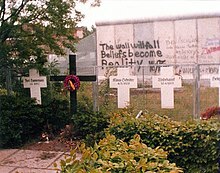 Robinson traveled to West Germany to inspect potential speech venues, and gained an overall sense that the majority of West Berliners opposed the wall. Despite getting little support for suggesting Reagan demand the wall's removal, Robinson kept the phrase in the speech text. On Monday, May 18, 1987, President Reagan met with his speechwriters and responded to the speech by saying, "I thought it was a good, solid draft." White House Chief of Staff Howard Baker objected, saying it sounded "extreme" and "unpresidential", and Deputy U.S. National Security Advisor Colin Powell agreed. Nevertheless, Reagan liked the passage, saying, "I think we'll leave it in." Chief speechwriter Anthony Dolan gives another account of the line's origins, however, attributing it directly to Reagan. In an article published in The Wall Street Journal in November 2009, Dolan gives a detailed account of how in an Oval Office meeting that was prior to Robinson's draft Reagan came up with the line on his own. He records vivid impressions of his own reaction and Robinson's at the time. This led to a friendly exchange of letters between Robinson and Dolan over their differing accounts, which The Wall Street Journal published. Arriving in Berlin on Friday, June 12, 1987, President and Mrs. Reagan were taken to the Reichstag, where they viewed the wall from a balcony. Reagan then made his speech at the Brandenburg Gate at 2:00 pm, in front of two panes of bulletproof glass. Among the spectators were West German President Richard von Weizsäcker, Chancellor Helmut Kohl, and West Berlin Mayor Eberhard Diepgen. A section of the wall mentioned in the speech. Later on in his speech, President Reagan said, "As I looked out a moment ago from the Reichstag, that embodiment of German unity, I noticed words crudely spray-painted upon the wall, perhaps by a young Berliner, 'This wall will fall. Beliefs become reality.' Yes, across Europe, this wall will fall. For it cannot withstand faith; it cannot withstand truth. The wall cannot withstand freedom." Another highlight of the speech was Reagan's call to end the arms race with his reference to the Soviets' SS-20 nuclear weapons, and the possibility "not merely of limiting the growth of arms, but of eliminating, for the first time, an entire class of nuclear weapons from the face of the Earth." The speech received "relatively little coverage from the media", Time magazine claimed 20 years later. John Kornblum, senior US diplomat in Berlin at the time of Reagan's speech, and US Ambassador to Germany from 1997 to 2001, said "[The speech] wasn't really elevated to its current status until 1989, after the wall came down." The muted response in the Western media contrasted with the reaction from the East: East German Politburo member Günter Schabowski considered the speech to be "absurd", and the Soviet press agency TASS accused Reagan of giving an "openly provocative, war-mongering speech." It was Schabowski who two and a half years later, on 9 November 1989, became the person to open the wall by providing a slightly mistaken answer on a press conference about changes in travel regulations for East German citizens. Former West German Chancellor Helmut Kohl said he would never forget standing near Reagan when he challenged Gorbachev to tear down the Berlin Wall. "He was a stroke of luck for the world, especially for Europe." In an interview with Reagan himself, he recalls the East German police not allowing people to get near the wall, which prevented the citizens from experiencing the speech at all. The fact that West German police acted in a similar way has, however seldom, been noted in accounts such as these. Peter Robinson, the White House wordsmith who drafted the address, said its most famous line was inspired by a conversation with Ingeborg Elz of West Berlin who had remarked in a conversation with him, "If this man Gorbachev is serious with his talk of Glasnost and perestroika he can prove it by getting rid of this wall." Despite Reagan urging Gorbachev to tear down the Berlin Wall, there are some such as Romesh Ratnesar of Time who commented that there is little evidence that the speech had any impact on the decision to tear down the wall, let alone an impact on the people he addressed. Another critic was Liam Hoare in a 2012 article in The Atlantic, who pointed to the many reasons for the tendency for American media to focus on the significance of this particular speech, without weighing the complexity of the events as they unfolded in both East and West Germany and the Soviet Union. Author James Mann disagreed with both critics like Hoare, who saw Reagan's speech as having no real effect, and those who praised the speech as key to shaking Soviet confidence. In a 2007 opinion article in The New York Times, he put the speech in the context of previous Reagan overtures to the Soviet Union, such as the Reykjavik summit of the previous year, which had very nearly resulted in an agreement to eliminate American and Soviet nuclear weapons entirely. He characterized the speech as a way for Reagan to assuage his right-wing critics that he was still tough on communism, while also extending a renewed invitation to Gorbachev to work together to create "the vastly more relaxed climate in which the Soviets sat on their hands when the wall came down." Reagan, claimed Mann, "wasn't trying to land a knockout blow on the Soviet regime, nor was he engaging in mere political theater. He was instead doing something else on that damp day in Berlin 20 years [before Mann's article] – he was helping to set the terms for the end of the cold war." ^ "Ronald Reagan speech, Tear Down This Wall". USAF Air University. Retrieved October 27, 2015. ^ Reagan, Ronald (June 11, 1982). Public Papers of the Presidents of the United States: Ronald Reagan, 1982. Remarks on Arrival in Berlin. ISBN 9781623769345. Retrieved October 27, 2015. ^ Reagan, Ronald (August 7, 1986). Public Papers of the Presidents of the United States: Ronald Reagan, 1986. Written Responses to Questions Submitted by Bild-Zeitung of the Federal Republic of Germany. ISBN 9781623769499. Retrieved October 27, 2015. ^ Walsh, Kenneth 2T (June 2007). "Seizing the Moment". U.S. News & World Report. pp. 39–41. Archived from the original on June 14, 2007. Retrieved June 27, 2007. ^ Dolan, Anthony (November 2009). "Four Little Words". Wall Street Journal. Retrieved June 10, 2012. ^ Robinson, Peter (November 2009). "Looking Again at Reagan and 'Tear Down This Wall'". Wall Street Journal. Retrieved June 10, 2012. ^ Dolan, Anthony (November 2009). "Speechwriters' Shouts of Joy in Reagan's Oval Office". Wall Street Journal. Retrieved June 10, 2012. ^ a b c "Ronald Reagan's Famous "Tear Down This Wall" Speech Turns 20". Deutsche Welle. June 12, 2007. Retrieved November 8, 2014. ^ a b c Boyd, Gerald M. (June 13, 1987). "Raze Berlin Wall, Reagan Urges Soviet". The New York Times. Retrieved February 9, 2008. ^ a b "Remarks on East-West Relations at the Brandenburg Gate in West Berlin". Ronald Reagan Presidential Library. Retrieved May 29, 2011. ^ a b c Ratnesar, Romesh (June 11, 2007). "20 Years After 'Tear Down This Wall'". Time. Retrieved February 19, 2008. ^ "Reagan's 'tear down this wall' speech turns 20". USA Today. June 12, 2007. Retrieved February 19, 2008. ^ Jason Keyser (June 7, 2004). "Reagan remembered worldwide for his role in ending Cold War division". USA Today. ^ Robinson, Peter (Summer 2007). "'Tear Down This Wall': How Top Advisers Opposed Reagan's Challenge to Gorbachev – But Lost". National Archives. ^ Hoare, Liam (September 20, 2012). "Let's Please Stop Crediting Ronald Reagan for the Fall of the Berlin Wall". The Atlantic. ^ Mann, James (June 10, 2007). "Tear Down That Myth". The New York Times. Retrieved May 1, 2017. Wikimedia Commons has media related to 1987 Ronald Reagan speech in Berlin. This page was last edited on 16 April 2019, at 11:45 (UTC).